These are the other highlights of our trip to Serikin this morning. 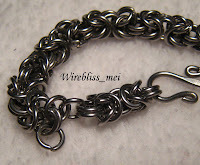 I found another chain maille bracelet. Actually i bought two of them, for dirt cheap price. Reason being both bracelets have have rings that came off at two different parts of the bracelets, so i bargained with the hawker. He said he is going to bring some more next week. Oh no...another trip to Serikin next weekend? Anyway, I managed to fixed them a while ago. Pictures shown here are taken before i fixed them. First chain maille training for me...hehe! 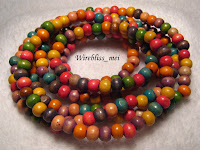 The other one is this colorful wooden beads necklace claimed to be from Bali, Indonesia. I just love the color of this necklace.....love at first sight! Its more than two ft long and the beads are about 7mm to 8mm in size. I can do a lot with this one....LOL! Labels: Bracelets | Cuff , Necklaces | Pendants , Wire Jewelry Share it!